Micaella Panessiti smiles as she crosses the finish line at the 117th Boston Marathon on April 15, 2013. It was supposed to be the perfect day. As a staff photographer for Tufts University, I was assigned to cover the Boston Marathon as our 100-plus-member charity capped off months of training and fundraising by crossing the finish line on Boylston Street. Stationed about 50 feet from the finish, my job was to make pictures of our runners as they were greeted by the team coach, Don Megerle. It’s been one of my favorite assignments every year—there’s so much joy, happiness and elation associated with every single one of the photos. What happened on Monday is not something you mentally prepare for. The first blast occurred less than a minute after I had photographed a Tufts runner crossing the finish. There was some confusion as to what had happened. I thought it was a cannon, much like we hear every Fourth of July at the Boston Pops concert on the Esplanade. No one seemed quite sure what had happened. Then the second blast went off, farther down Boylston Street. Pandemonium erupted as spectators knocked over the crowd-control barriers and scattered. After running back toward the front of the Boston Public Library with coach Megerle and another member of my photo team, I saw my colleague Stuart Cahill, a photographer for the Boston Herald, run toward the site of the first blast. I turned and told Megerle I had to go, and followed Cahill into the smoke. I made a few pictures of the injured emerging from the smoke on wheelchairs. I couldn’t see much through the haze, so I ran up the photo bridge, suspended above the finish line, to get a better view. At heart, I am a photojournalist, having worked for newspapers and wire services for the better part of the last 10 years. We often ask ourselves how we would react in a tough situation, because invariably, we end up covering fires, shootings and other tragedies. This was different, though, and I had no idea what I would see from the top of the bridge. Carlos Arredondo, left, rushes Jeff Bauman Jr., right, to aid after Bauman was caught in the blast of one of the two bombs that exploded along Boylston Street at the finish line of the Boston Marathon on April 15, 2013. Bauman survived his injuries. Right away I knew it was bad. I saw people with horrendous injuries, one in particular that was difficult for me to look at, or photograph. 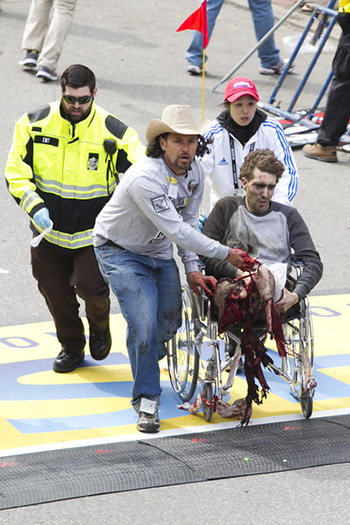 The man, later identified as Jeff Bauman, had lost both legs below the knee and was being carted away on a wheelchair as the now well-known peace activist Carlos Arredondo sprinted beside him, applying tourniquets to both limbs. The response from emergency personnel and bystanders was impressive, a description that even now seems meager, given what they did. Those who ran toward the blast scene, without giving thought to their own safety, easily outnumbered the victims, three to one. Every single one of those people is my hero. Seeing Cahill, the Boston Globe’s David L. Ryan and AP’s Charlie Krupa—whose photo of Bauman was on front pages around the world on Tuesday— work amid the chaos to make sure the horror of this event was captured and remembered was incredible. The work of the Globe’s John Tlumacki, who was on the ground and whose account is now in Time magazine, absolutely needs to be seen. We were evacuated off the bridge shortly thereafter, at which point I texted my mom that I was OK and sent out a two-word Tweet—“I’m OK.”—for everyone else. I then contacted Bloomberg Photo Service, and the photo editor, Graham Morrison, encouraged me to find a place to sit down, regain my composure and transmit the images I had captured. I was running on pure adrenaline and had no idea what to do, but Morrison’s reassurance and counseling through all of the trauma and chaos helped me stay grounded in the situation. After securing an Internet connection in the Prudential Center, I pushed my photos to the wire. My mom, who had not received my text because the cell towers were overloaded, learned I was OK because my sister saw my photos on the Washington Post news site and called her. I ran into one of my reporter friends who had run the marathon. He was diverted from the course and ended up at the Pru. I gave him my last bottle of water, and showed him my photos. I sent more emails and made more social media posts to let people know I was OK, and then headed back toward the scene, making some more photos along the way. My friend, Dominick Reuter, found me on the street and stuck with me for the rest of the day. Monday night was strange. I didn’t know how to feel. It was like a mix of sadness and anger, but mostly numbness. I made sure I was with friends. I made calls to friends and family. I got into bed, but didn’t sleep—all I could think about was the image of Bauman and his injuries. By morning, I had come down from the adrenaline high and broke down in between more phone calls from friends and family. I didn’t know what to do, and pacing around my house wasn’t helping. So I did the only thing I knew how to do and went back down to the scene to make some more pictures and try to process what happened. 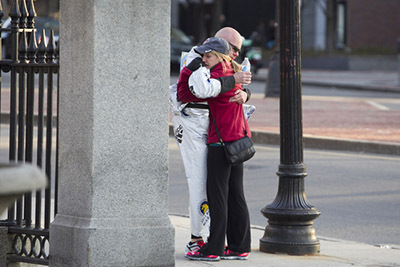 A runner is reunited with a family member on Boston Common after two explosions occurred along the final stretch of the Boston Marathon on Boylston Street in Boston, Massachusetts, U.S., forcing runners to be redirected after the race was shut down. That helped. I ran into other photojournalists doing the same thing. I was pretty much useless as a photographer, but seeing familiar faces was comforting. The outpouring of support from the photojournalism community has been incredible; whether it is from people I’ve known for years to someone I just met on Monday. I can’t express enough how grateful I am to have such supportive brothers and sisters in my corner every step of the way. There were a surprising number of runners jogging around the security perimeter on Tuesday—seemingly in defiance of what had happened the day before. Some might even say it was a typical response for Bostonians. Tuesday afternoon, I attended a reception for the Tufts Marathon Team. It was a relief to see everyone safe and accounted for. I broke down again as I apologized to coach Megerle for leaving him at the finish line. I also tracked down the last runner I photographed before the blast and gave her a hug. Down to a matter of seconds, it really was a miracle she was standing there unscathed. I have never been so happy to see someone I hadn’t met yet. Around 9 p.m. Tuesday, I saw a familiar face on the New York Times website. Jeff Bauman, whose horrific injuries had kept me awake the night before, had survived and was stable in a local hospital. Learning that he had made it lifted the heavy cloud that had engulfed me. His recovery will no doubt be long and difficult, but he is still with us. The day before the marathon, I had worked on a story for the Boston Herald about an Army captain, Jake Murphy, who had lost both of his legs to an IED in Afghanistan in July 2011. He was preparing to compete in the Boston Marathon’s handcycle division after a long rehab. I hope Bauman’s recovery goes that well, and that maybe they could both get in touch with each other at some point. 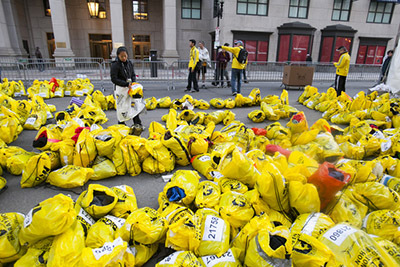 A volunteer sorts through the unclaimed bags of runners after two explosions occurred along the final stretch of the Boston Marathon on Boylston Street, stopping the race, in Boston, Massachusetts, U.S., on Monday, April 15, 2013. My heart goes out to all of the victims, who will no doubt have a long and difficult road to recovery. My thoughts are also with those who witnessed everything first hand and will have mental issues of their own to deal with. What struck me most about the horror of the situation was not the devastation and the chaos, but the fact that so many people ran toward the danger to help those in need without giving a second thought about themselves. That seems to be a recurring thread in everyone’s recollection of what happened, and it can’t be repeated enough. As a member of the media, I will inevitably receive negative comments and criticism about the photos that I took, because some people disagree about what the public should and should not be able to see. I understand that. But as a professional witness, I don’t know how else to show not only the evil of the world, but also the compassion and humanity that ultimately overcomes it, like the actions of the first responders and volunteers who dove headfirst into the smoke to save so many lives on Monday. Boston is my hometown. I have no doubt the people of this city can overcome this. If the actions of the first responders, the vigils of the community, and just seeing so many people out there running the streets the morning after are any indication, I know we’re well on our way.